IPSWICH — Ipswich Police Chief Paul N. Nikas and Police Lt. Jonathan Hubbard, the town’s Emergency Management Director, report that the Ipswich Police and Fire Departments this morning responded to a boat fire in Ipswich Town Wharf. 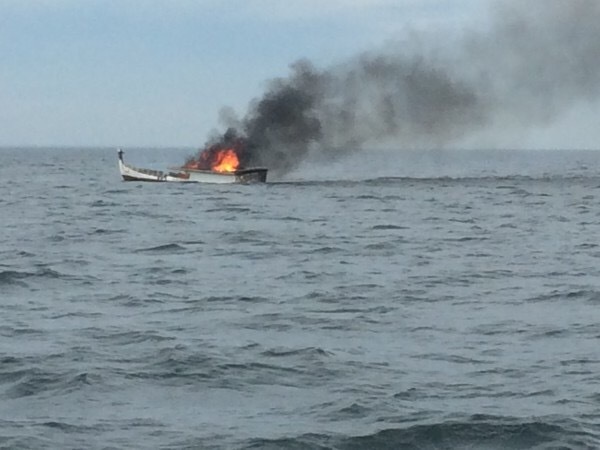 The Ipswich Fire Boat was dispatched, as well as the Ipswich Police Department Marine Patrol at about 9 a.m. Friday for a report of a vessel on fire. The captain reported to rescuers that he was hauling lobster traps when he observed a fire that broke out in the wheel house. The captain immediately radioed a mayday to the United States Coast Guard, donned his emergency suit, and secured a waterproof survival bag with supplies and a portable radio. He also deployed his EPIRB distress radio-beacon to continuously relay his position. He finally grabbed some additional buoys for flotation and went into the water to escape the fire. Water temperature at the time was 52 degrees. The captain was rescued a short time later by a good Samaritan vessel. The vessel, a 1977 28-foot wood-hulled lobster boat named the Dawn Breaker, out of Ipswich, was destroyed by the fire. The captain was not injured and was evaluated by emergency medical personnel on shore. He declined medical treatment. The Beverly Fire Department Dive Team, the Gloucester Police Department Marine Unit, and the United States Coast Guard also responded to the scene. Emergency units stood by until the vessel sunk off Emerson’s Rocks near Plum Island and coastal Ipswich.